string(1106) "Resource Centre > Uncategorized > GNI Principles on Freedom of Expression and Privacy"
These Global Principles on Freedom of Expression and Privacy (“the Principles”) have been developed by companies, investors, civil society organizations and academics who aim to protect and advance freedom of expression and privacy in the Information and Communications Technology (ICT) industry globally. 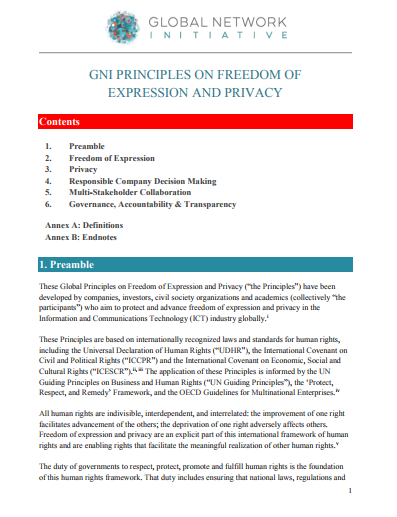 These Principles are based on internationally recognized laws and standards for human rights, including the Universal Declaration of Human Rights (“UDHR”), the International Covenant on Civil and Political Rights (“ICCPR”) and the International Covenant on Economic, Social and Cultural Rights (“ICESCR”). The application of these Principles is informed by the UN Guiding Principles on Business and Human Rights (“UN Guiding Principles”), the ‘Protect, Respect, and Remedy’ Framework, and the OECD Guidelines for Multinational Enterprises. All human rights are indivisible, interdependent, and interrelated: the improvement of one right facilitates advancement of the others; the deprivation of one right adversely affects others. 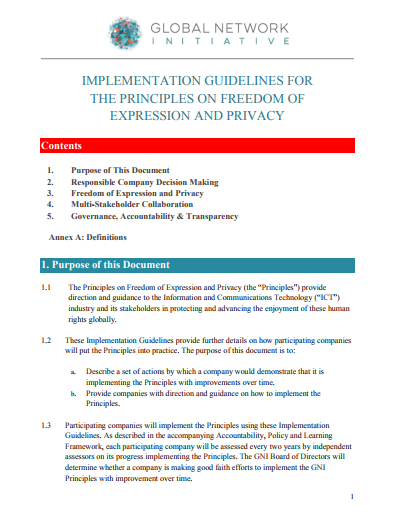 Freedom of expression and privacy are an explicit part of this international framework of human rights and are enabling rights that facilitate the meaningful realization of other human rights. This Handbook is to be used by General Managers in conjunction with the Stop Slavery Blueprint and provides example documents that can be adapted and used accordingly.